LOCATION Mulberry Gardens is a small development of houses and apartments built in 2003. Broadbridge Heath is located within 2 miles of Horsham town centre offering Post Office, local stores, primary school, Tesco superstore and leisure centre. Horsham, just a short drive away, is a thriving historic market town with an excellent selection of national and independent retailers including a large John Lewis at Home and Waitrose store. PROPERTY This two double bedroom, two en suite end of terrace property comes to the market with the added benefit of no onward chain. The lounge, with bay window and doors to the garden, is large enough to accommodate both lounge and dining furniture. The kitchen has all the space and storage needed for such a house and over looks to the front of the property. A useful cloakroom is accessed from the entrance hall. 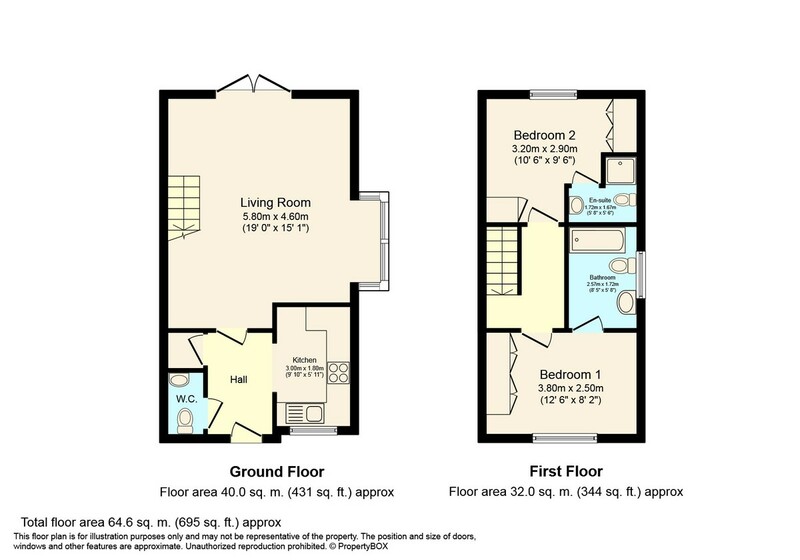 To the first floor are two double bedrooms both of which have en suites. The property enjoys a great size plot and we believe that an extension would be easily accommodated subject to planning. OUTSIDE The property benefits from a large corner plot garden which extends to the rear and side of the property with paved patio to the rear of the property, this in turn leads to an expanse of lawn with both flower and shrub borders enjoying a high level of seclusion with fencing to the side and rear. The property has a garage with an up and over door, pitched roof for storage and side access door to the garden.